As we have just updated our China Digital Marketing Strategy Guide, Lei Chien, the author of the guide, has produced the article below on how brands are building trust in China and outlines the key marketing trends to be aware of. With 2018 Lunar New Year around the corner, many marketers in China can finally take a deep breath and enjoy a break from a very busy year. To the world, the growth of China's digital economy is no longer a mystery. To say it's a force to be reckoned with can arguably be an understatement. China's continued progress in the digital space is contributed by innovations, fearless attitude towards failure, tech-friendly regulations, and of course its massive consumer market. Cryptocurrency: China mines more Bitcoins than any other country, despite the ban. Mobile payments: mobile payment continue rise while cash usage declines. Experience-driven retail: offline stores have begun to focus more on in-store experience. Shared economy: shared bikes and even umbrellas are prevalent in parts of China. Umbrella is often used not only during the raining season but also hot summer days in China. Here is a digital umbrella sharing stall inside Shanghai's metro stations. Demand for better health has been on the rise. 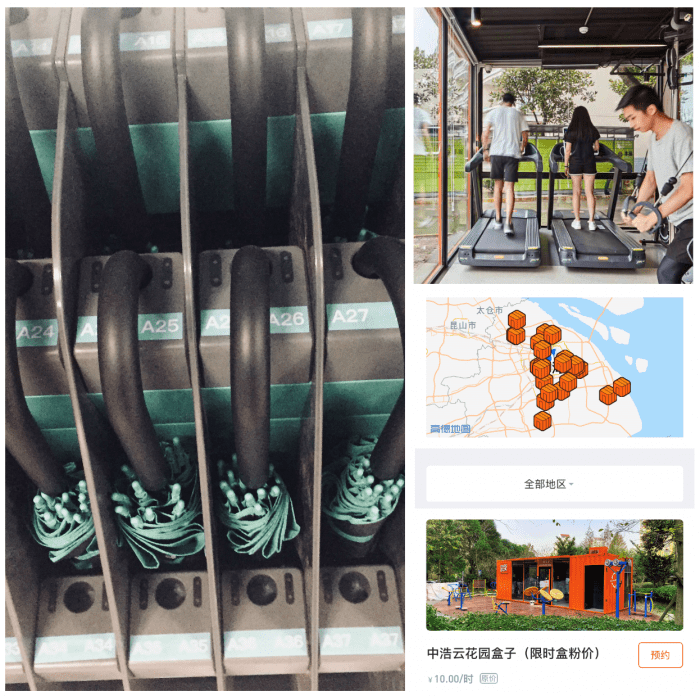 Parkbox is a staff-less, 24/7 container gym that cost as low as 10rmb per hour. Due to the market's fast growth, the expectation from the consumers is also gaining traction. More and more savvy Chinese consumers, in search of a more balanced lifestyle, are favoring companies and brands that align their businesses with customers' values. The brands are well aware of this and have started changing the way their business operates to match the informed. In my China digital marketing strategy guide, I discussed some of the latest in the country's digital landscape. In this blog, I will discuss how some successful brands that are currently thriving in China are strategically embracing these demands by focusing on the need of the consumers- in this case, the growing need for transparent consumption. 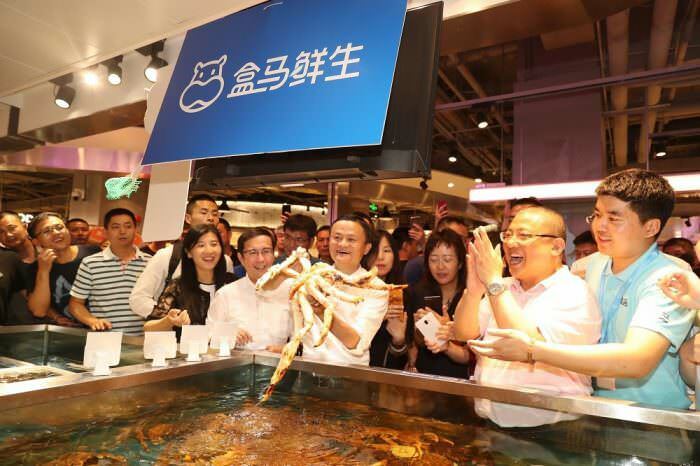 I am going to provide two businesses as examples of this latest trend, namely: Alibaba's omnichannel grocery retail chain "Hema Supermarket" which is gaining popularity by storm. And the world's biggest and most advanced Starbucks that is newly built and located in Shanghai. Before we get into how transparency is a great value proposition and the way it's taking place in China, I think it's important to quickly discuss the why. Many environmental factors are behind the increased momentum of this trend. Traditional media in China, which has always been regulated, is debatably consumed with a feeling of indifference with a lean towards skepticism. Fears about the safety of food products made in China have deep-seated in the wake of nationally exposed incidents- such as the baby milk powder and gutter oil scandals, have taught consumers to be always on alert and find ways to protect themselves and their loved ones. Knowing this, businesses in China must find ways to rebuild consumer's confidence by creating shopping experiences that include providing them with trustworthy product information at the tip of their fingers (mobile), and more transparency to their businesses to combat their fears. Here are two that have demonstrated this through their operations. Tech giant Alibaba operates in number of different sectors to expand their presence in the digital eco-system. 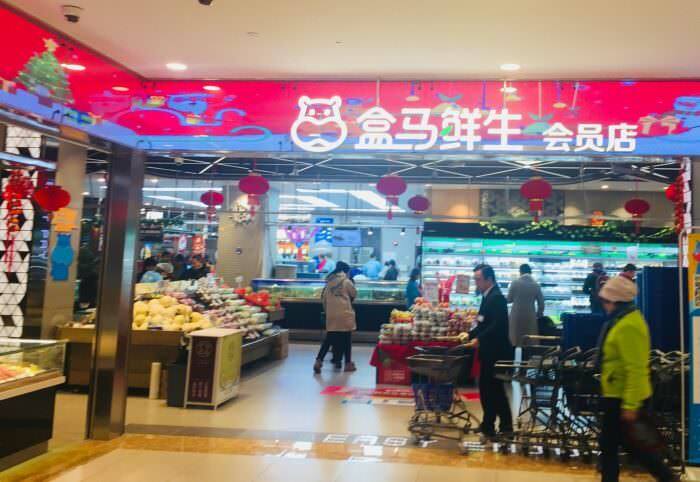 One of its hottest growing divisions, Hema Supermarket, is a multi-channel grocery chain that is expanding rapidly in China's top tier cities. It offers both online purchase with same-day delivery and in store shopping. Traditional grocers such as Lianhua have fallen behind when it comes to digital transformation with no APP insight. Hema has become a game changer for many busy Chinese consumers. Despite the online shopping boom, when it comes buying health related products, consumers in China are often skeptical and will take their first experience with a brand offline. This is just so they can visually see and feel what the it is actually like for themselves. Once they are satisfied with the product, the next purchase often takes place online. "The major goal is to drive offline customers to shop online" said Yi Hou, the founder of Hema. So, how does Hema impress customers with their offline store? Through speed and transparency. 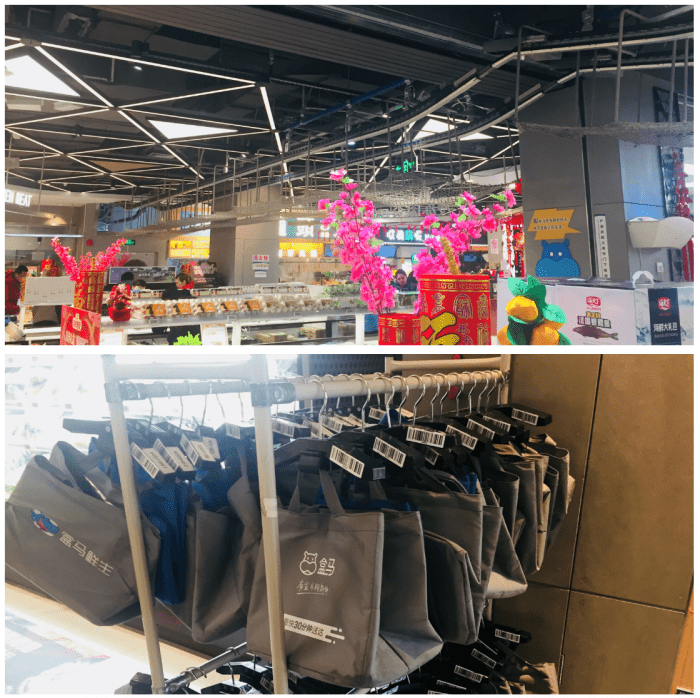 From the second you step into a Hema store, everything projects a glowing vibe of difference compare to what a typical "around the block" grocery store offers. From its cleanliness to its staffs bustling around the store (I will explain why), in-store dinning, and mobile friendly tags, everything seems to suit the local's taste - speedy, crowded in a vibrant way, fresh, and digital. The first step to becoming Hema's member is by downloading its APP. This is the enabler that has allowed consumers the pleasure of having their daily groceries delivered to their homes on time. The delivery is often as fast as 30 minutes and the logistic itself behind this operation is simply impressive. It leverages data and smart logistics to provide exceptional service and efficient delivery. Hema has positively changed the life of many people in China, who are often consumed by the challenges of the fast-paced environment and have less time dedicating to regular chores such as grocery shopping. A Hema store in Shanghai. Inside, the store integrates smart devices and efficient logistics to enable online and offline orders. More Hema stores will open in 2018 across China. But this is more than just being able to have fresh food delivered to your door steps in just 30 minutes. For orders that are placed online, the fresh groceries are often picked up on the same floor space as those who are shopping inside the store. This is very different than a typical supermarket and delivers a special "effect" that has on consumers. The fact that your groceries are picked up by staffs in the store (who can be seen running around quite often), while being surrounded by a number of shoppers who likely witnessed this process, in a way, is very comforting to many people in China. It almost feels as if your grocery went through a quality check, and did not just come out of some random, behind-the-curtain warehouse. The tracks lay above the store that enables orders to go out, in plain sight of customers (top). Bar-coded bags that integrate systems to efficiently ensure the products are picked up and sent out. To see how orders are picked up by Hema staff, see the video clip below. As customers shop, Hema staff pick up the products, put them in the bar-coded bags to match orders, and use the movable tracks above to send the orders out through the "sky track" above the store. On top of the "safety net" feeling that has been created, the store is also designed in a way that aligns itself with "transparency". Large, clear seafood aquariums that show the "catch of the day"- including lobsters, king crabs, and oysters. Shoppers can pick out their own seafood and choose the ideal size to take home. Products are tagged with QR codes that allows customers to use the Hema APP to learn more details about them. Most fresh foods have short expiration dates to let people know that they're getting the freshest food. All this has made Hema's offline stores a unique place for shoppers. Jack Ma of Alibaba visits one of the Hema stores. The open aquarium is a display of "nothing to hide." The exceptional detail Hema puts into its products is often amiss with traditional grocers in China. Fresh fruit packaging have stickers that inform the customers the "degree of ripeness" so customers can make a judgement on when to eat the produce. Another benefit is the return process. The second you identify any "less than fresh" food, you can contact customer service through your APP for help. Often times a refund is immediately issued for the bad products. Although this is a huge gain in terms of customer satisfaction, whether this return model is sustainable is questionable. But for now, this has only increased consumers' love for Hema as it expands. As of February 2018, 30 more stores are on track to open in Beijing. By being openly transparent and providing what the competitors aren't, Hema is carving out its own market and more importantly, building a very strong loyal fan base. Starbucks' history in China is no mystery. It currently has more than 3,000 stores in China and plan to open 2,000 more in 4 years. 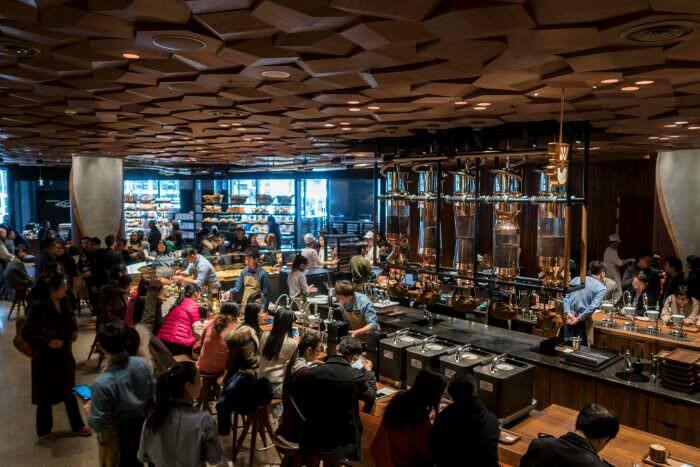 In December 2017, Starbucks opened its largest Roastery store in the world in Shanghai- a two-story, 30,000-square-foot behemoth filled with 400-plus employees and twice the size of its flagship location in Seattle, home of its headquarter. Aside from the sheer size of the store, it has also described as the "most advanced Starbucks" by many. The world biggest Starbucks opened in December 2017, located in Shanghai. Coffee consumption in China has been on the rise and competition in the industry has been fierce. 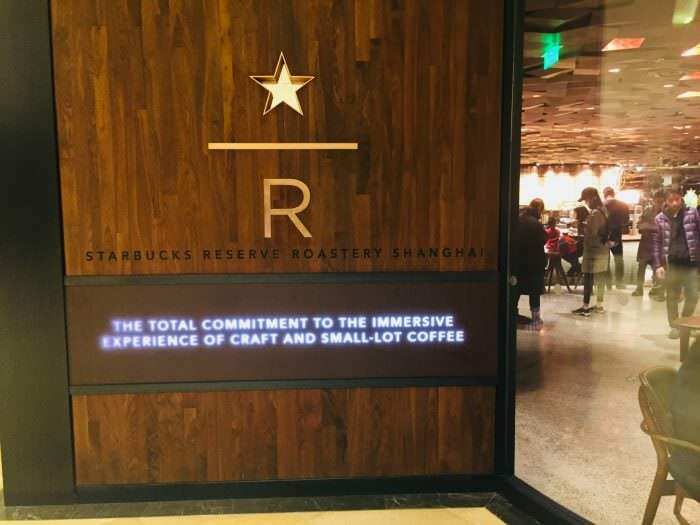 Starbucks faces challenges from small local brands and large brands like Costa, and Peet's Coffee, which made its entry to China just a few weeks before the Roastery's grand opening. Aside from this new store, majority of the Starbucks in Shanghai also recently went through a face-lift to make the stores more about experience. No longer just a feel of "order then sit", added are hand brewed coffee counters where customers can order more variety and premium coffee through professional baristas. You can improve your in-store experience through its APP. It's also social media friendly. Additionally, the store has a "first fully immersive coffee experience". Customers inside the Roastery can use its APP that leverages AR (augmented reality) to see certain parts of building "come alive". A wealth of detailed information will follow and during this in-store AR journey, which allows customers to unlock virtual badges that they can share with their friends on social media. 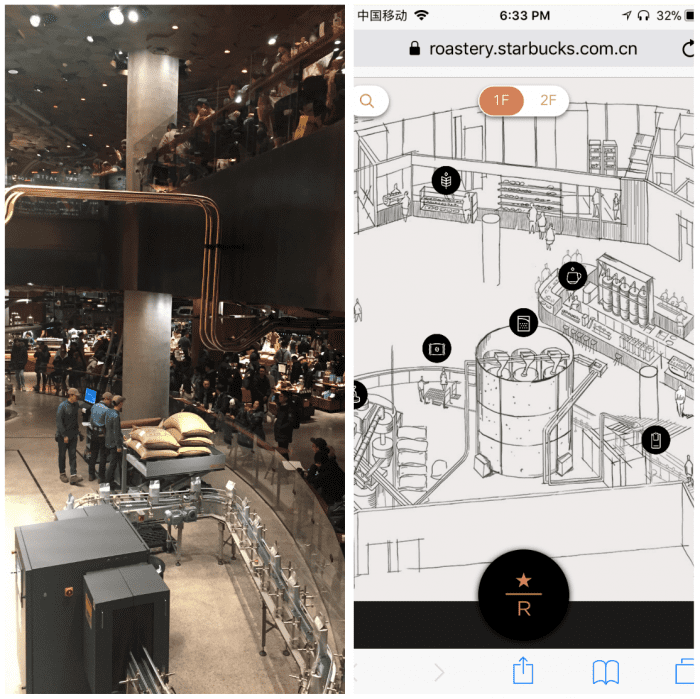 This digital experience is designed by Starbucks and powered by Alibaba Group's scene-recognition technology makes it a unique experience for the customers. 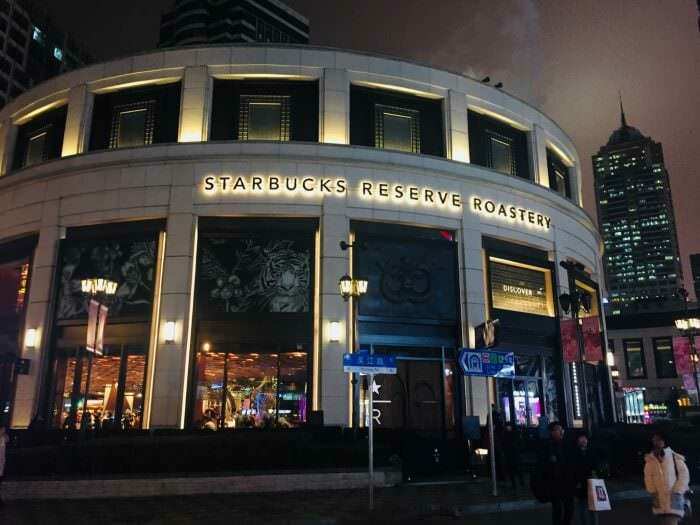 Experience-driven retail is the key to Starbucks' future path in China. So, what makes this Starbucks "transparent"? From the second you step in the store, you see the similar sky track set-up Hema has leveraged that shows customers Starbuck's "process". Except in this case, the tracks have been replaced by clear pipes that carry raw beans to roasters. From there, the beans go through the pipes to the baristas, who are there to provide you with some "very fresh" coffee. The entire store gives you the feeling of being inside a coffee factory than a traditional coffee shop. This store's design, along with many newly renovated smaller Starbucks in Shanghai, all provide the same message- "let us show you, openly, how your drink is prepared". This is a powerful message in the context of China, where skepticism is prevalent when it comes to the quality and safety of consumables. The transparent process puts customers first and at ease. Not only do they realize this is a high-tech Starbucks with fresh beans, they actually get to see the coffee making process from the beginning to the end. Like a cup of coffee, this is quite eye-opening. "In my long, long history of Starbucks, I have never, ever seen anything remotely like what happened when we opened the Shanghai Roastery. We shattered every sales record in the history of the company." Lei Chien is a partner of the start-up www.plantasia.asia in Shanghai, China. With over 10 years of experience in digital marketing, he knows that the passion for creativity will always remain; the only things that have changed are the powerful tools and the complex interfaces. His previous employers include IKEA, Mars, and Alibaba Group.